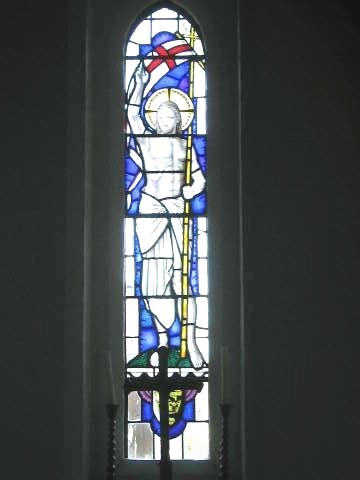 The memorial is within Church of All Saints, Cross Oak Road, Berkhamsted, Herts. (Note: There are many different ways of spelling Berkhamsted. Sometimes there is a “p” before the “m” and sometimes an “a” before the “d”. 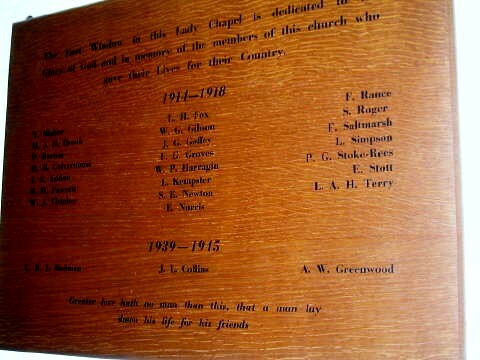 For the purposes of this entry, we have used the spelling Berkhamsted throughout) The memorial is on a wooden plaque inscribed in gold; the window has an inscription also. Private 105787. Hertfordshire Yeomanry. Died in Mesopotamia on 29th May 1917. Aged 19. Born Great Berkhamsted. Enlisted Hertford. Son of Herbert and Alice Culverhouse, of 23 and 24, Gossoms End, Berkhamsted, Herts. Buried: Baghdad (North Gate) War Cemetery. Iraq. Ref. XV. J. 9. Corporal S4/218803. Deputy Assist. Director of Labour H.Q. (Dieppe), Royal Army Service Corps. Died on 16th February 1919. Aged 32. Husband of Mimlie Eliza Eddon, of 13, Shrublands Avenue, Berkhamsted, Herts. Buried: Janval Cemetery, Dieppe, Seine-Maritime, France. Ref. II. G. 1. Second Lieutenant. 1st Battalion Bedfordshire Regiment. Killed in action on 26th April 1915. Commemorated: Sp. Mem. D. 2, Tuileries British Cemetery, Ieper, West-Vlaanderen, Belgium. Lance Corporal 203460. 1st/4th Battalion Duke of Wellington's (West Riding Regiment). Killed in action in France & Flanders on 23rd December 1917. Aged 19. Lived Berkhamsted. Enlisted Hertford. Son of Joseph and Mary Fletcher of 30, Gossoms End, Berkhamsted, Herts. Buried: Duhallow A.D.S. Cemetery, Ieper, West-Vlaanderen, Belgium. Ref. VIII. C. 27. Second Lieutenant. 4th Battalion attached to 2nd Battalion Bedfordshire Regiment. Killed in action on 11th July 1916. Commemorated: Thiepval Memorial, Somme, France. Pier and Face 2 C.
Private G/64074. 23rd Battalion Royal Fusiliers. Killed in action in France & Flanders on 23rd March 1918. Aged 38. Enlisted Berkhamsted. Son of Robert Henry and Ellen Gibson, of 3, Cross Oak, Berkhamsted; husband of Elizabeth Gibson, of 24, Charles St., Berkhamsted, Herts. Commemorated: Arras Memorial, Pas de Calais, France. Bay 3. Second Lieutenant. 23rd Battalion attached to 17th Battalion King's Royal Rifle Corps. Killed in action on 3rd September 1916. Aged 18. 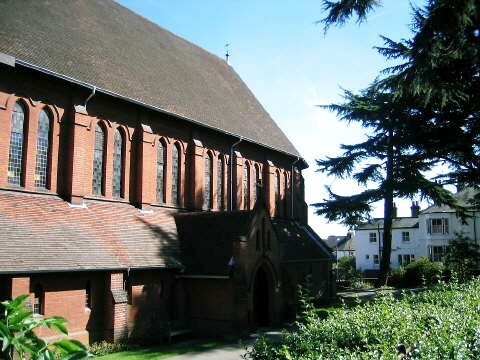 Son of Harry and Elinor Goffey, of "St. Mildred's", Cross Oak Rd., Berkhamsted, Herts. Educated at Berkhamsted School. Inns of Court, O.T.C. Buried: Ancre British Cemetery, Beaumont-Hamel, Somme, France. Ref. V. B. 21. Private 265789. 1st/1st Battalion Hertfordshire Regiment. Died of wounds in France & Flanders on 1st October 1917. Aged 29. Born and lived Berkhamsted. Enlisted Hertford. Son of George and Ellen Groves, of 5, Charles St., Berkhamsted, Herts. Buried: Godewaersvelde British Cemetery, Nord, France. Ref. I. L. 3. Lieutenant. Argyll and Sutherland Highlanders, attached to King's African Rifles. Died on 1st November 1918. Aged 34. Son of William and Mary Harragin; husband of W. F. Harragin, of "Massater", The Beach, Shoreham by Sea. Buried: Dar Es Salaam (Upanga Road) Cemetery, Tanzania. Ref. VIII. B. 1. Lance Corporal 41316. "A" Company, 2nd Battalion Bedfordshire Regiment. Killed in action in France & Flanders on 22nd August 1918. Aged 19. Born and lived Berkhamsted. Enlisted Bedford. Son of Mrs. Sarah Kempster, of 38, Shrublands Avenue, Berkhamsted, Herts. Buried: Albert Communal Cemetery Extension, Somme, France. Ref. II. A. 7. Private 38322. 1st Battalion Royal Berkshire Regiment. Formerly M2/176120 Royal Army Service Corps. Died of wounds in France & Flanders on 9th March 1918. Aged 24. Born Twickenham. Lived Berkhamsted. Enlisted Brockenhurst, Hampshire. Son of Daniel and Emily Newton, of 55, Kitsbury Rd., Berkhamsted, Herts. Native of Twickenham, Middx. Buried: Rocquigny-Equancourt Road British Cemetery, Manancourt, Somme, France. Ref. X. C. 13. Probably: William Edward Norris. Private 43181. 2nd Battalion Northamptonshire Regiment. Formerly 26983 Bedfordshire Regiment. Died of wounds in France & Flanders on 30th December 1917. Aged 33. Born Berkhamsted. Enlisted St. Albans. Son of Emma Norris, of 35, Cowper Rd., Berkhamsted, Herts, and the late Walter Norris. Buried: Lijssenthoek Military Cemetery, Poperinge, West-Vlaanderen, Belgium. Ref. XXVII. C.C. 19. Private 23251. 7th Battalion Border Regiment. Formerly 12144 Norfolk Regiment. Killed in action in France & Flanders on 6th August 1916. Aged 24. Born and lived Berkhamsted. Enlisted Bedford. Son of Charles and Daisy Rance, of 1 Queen's Rd., Berkhamsted, Herts. Commemorated: Thiepval Memorial, Somme, France. Pier and Face 6 A and 7 C.
Company, 3rd Battalion, London Regiment (Royal Fusiliers). Killed in action in Gallipoli on 28th November 1915. Aged 21. Lived Great Berkhamsted. Enlisted Edward Street. Son of Frank and Mary Jane Saltmarsh, of "Hythe, Doctors Commons Rd., Berkhamsted. Commemorated: Helles Memorial, Turkey. Panel 196. Second Lieutenant. 3rd Battalion The Queen's (Royal West Surrey Regiment). Died on 5th April 1920. Aged 35. Son of Henry and Margaret Ann Simpson; husband of Margaret Mary Simpson, of Overton House, Berkhamsted. Buried: Great Berkhamsted (St. Peter) Church Cemetery. Ref. Row 1. Lieutenant. 205th Training Depot Station, Royal Air Force. Died on 18th June 1918. Buried: Vendome Town Cemetery, Loire-et-Cher, France. Ref. A. 11. Master. S.S. Conch, Mercantile Marine. Died on 7th December 1916. Son of the late Hugh Stott, M.D., and Janette Stott; husband of Azila Marianne Stott, of 5, Boxwell Rd., Berkhamsted, Herts. Commemorated: Tower Hill Memorial, London. Private 5726633. 4th Battalion Dorsetshire Regiment. Died on 10th July 1944. Aged 25. Buried: Banneville-La-Campagne War Cemetery, Calvados, France. Ref. X. C. 24. Chief Engine Room Artificer. C/M 7196. H.M.S. Raleigh, Royal Navy. Died on 17th February 1042. Aged 50. Son of A. Edwin and Mary Elizabeth Greenwood; husband of Florence Agnes Greenwood, of Berkhamsted. Buried: Great Berkhamsted (St. Peter) Church Cemetery. Ref. Row 7. Grave 59.